During the last decade of the 20th century a totally novel way of gene regulation was revealed. Findings that at frst glance appeared freak features of plants or C. elegans turned out to be mechanistically related and deeply conserved throughout evolution. this important insight was primed by the landmark discovery of RNA interference, or RNAi, in 1998. This work started an entire novel feld of research, now usually referred to as RNA silencing. the common denominator of the phenomena grouped in this feld are small RNA molecules, often derived from double stranded RNA precursors, that in association with proteins of the so-called Argonaute family, are capable of directing a variety of effector complexes to cognate RNA and/or DNA molecules. 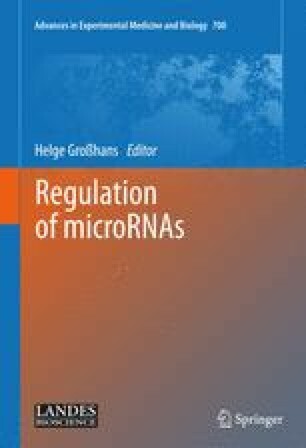 one of these processes is now widely known as microRNA-mediated gene silencing and I will provide a partially historical framework of the many steps that have led to our current understanding of micro RNA biogenesis and function. this chapter is meant to provide a general overview of the various processes involved. for a comprehensive description of current models, I refer interested readers to the reviews and primary literature references provided in this chapter and to the further contents of this book.